Now that my new collection of stories, Nine Facts That Can Change Your Life (Serving House Books), has been published, I’ve begun to think more about the process of writing—what writing means to readers, what it means to me. I’ve thought about the difference between writing a story and building a collection of stories, and what happens when a book is launched into the world. A collection is a different entity from a single story. Putting together a book is like creating an issue of a literary magazine. The writer has to consider the individual stories and the composition of the book as a whole. For my new book, I pulled together disparate pieces of my work and had to arrange the stories in a logical order that made it seem as if the stories were inextricably connected. I was faced with choices and decisions. Doubt crept into my thinking. Could I really create a collection of stories that would work and coalesce? I had written lots of stories, more than could fit into one book. I piled them on my desk and read them, added stories to the manuscript, took out others. Nine Facts That Can Change Your Life has had a different title, a different epigraph. The selection of stories changed over time and so did the order. When I wrote a story I considered strong, I removed a weaker one from the manuscript. The book includes two pieces that weren’t part of the manuscript I submitted to Serving House Books. And as I was preparing the pages for galleys, I decided to add “Bare Essentials.” I’d removed the story earlier, but the piece tugged at me. As I read the stories in the collection, I learned that the unconscious has a will of its own. I was surprised to find I’d repeated similar images, even the same names and words in stories. I wasn’t aware of the repetition when I wrote the pieces, but it was there, on the pages. I’d used the word “foolish” too many times, and described buildings as “red brick.” I had to find replacements. I didn’t include some of my favorite stories in the book. They either didn’t reflect the book’s themes or touched on ideas explored in other pieces. Parting with these stories was hard, like leaving a dear friend whose company I cherished. My collection went through many lives. It was in flux. A friend recently described a woman, saying, “She lived alone.” She meant that the woman had lived alone as a child. Not literally. The woman had lived inside of herself as a child; she wasn’t heard by her parents. I found this observation chilling: A child with thoughts and emotions whirling and no place to put them, no receptacle, no possibility of discussion or sharing. We’ve all had that feeling at one time or another, of not being heard, and felt the tension between what we wanted from parents and what they gave us. I thought of my childhood and the times when I had experienced living alone even though I was with family or friends. What are the ways we can be heard? Some people talk a lot, perhaps trying to compensate for what they didn’t receive as a child. Some retreat into silence, a familiar stance. And, perhaps, others become writers. Is that why we write—so our thoughts, voice, and vision can be heard? The irony is: there’s no guarantee of an audience, even if a story is published in a literary journal. “There’s no echo,” a writer friend once said. The story may have a relationship with the reader, one the writer will never know about. Some of the stories in Nine Facts That Can Change Your Life had been published in literary journals. I revised them again for the book. I’d considered them finished, but realized they needed work. The editor suggested changes, too. I saw the stories with fresh eyes and altered scenes and images. I had never been happy with the ending of one. The story seemed to stop; I wrote a new ending. I labor over a story, examining descriptions, words, images, and character development, and try to make a piece work, even sing, if I’m lucky. This is challenging, sometimes punishing labor. Even when I’m not writing, a story pours through my mind. Often the key to a piece comes to me when I’m not at my desk. Sometimes I never find the key. I’ve thought about a story in the middle of the night, fallen asleep, and awakened to find the thoughts lost. What seemed essential in the night was obliterated in the morning. Had I really finished the published stories or just abandoned them? When I decided I wanted to write, I took classes at the University of Denver in the graduate school creative writing program. I was in my thirties, older than other students—the mother of two children, and then three. I was allowed to attend classes without being enrolled in the program. The professors met with students individually during office hours. At my appointment with one professor, he said, “What are your goals for writing? What do you want?” He had gray hair and a wrinkled smile. He was in his fifties or sixties. He had been writing for a long time. “Don’t you want to write the great American novel and be on the cover of TIME magazine?” he asked. I imagined he was joking, but realized he was serious. Was this what he had once wanted for himself? What he had suggested seemed to cheapen writing, as if TIME magazine was the arbiter of literary taste. I was surprised by the question, though I shouldn’t have been. He was talking about fame, recognition, celebrity. He knew how difficult literary fame is to achieve and how brightly seductive it is. He knew a writer had to be realistic: to write, you have to sit in a chair alone in a room and put in the time. This isn’t glamorous like a splashy photo on the cover of a magazine. He knew about years of rejection, the small victories of publishing stories in literary journals. When I left his office I felt confused. Should his suggestion be my goal? No. I wanted to write without trying to fit my work into a category. I wanted to say what I wished without shaping it for a purpose or audience. I didn’t know at the time I spoke to the professor that I would have my own version of the TIME magazine fantasy. I wanted to have a book published by a large New York publishing company, with its resources and possibilities for promotion. This didn’t happen. And for a while I was disappointed. Writer friends told me not to be discouraged; rejection was part of the process, part of the business of writing. They were right. I collected rejections from literary journals, agents, big publishers, small presses, contests. Each story of mine that appeared in a literary journal felt like a gift. I began to understand the thrill of these victories. And I’m grateful that three terrific independent presses published my books and took great care with them, nurturing the work. Readers may see something in the work that wasn’t intended. There is the possibility of misunderstanding. In my novel, On Bittersweet Place, a scene unfolds in which an uncle inappropriately touches the narrator, Lena. I made this up. The incident seemed to describe the uncle’s character and was a burden Lena had to carry through the book. However, my cousin read the novel and told me that an uncle by marriage had done something similar to her. She was surprised I knew about this. Though that was my cousin’s sense of things, I hadn’t known about her upsetting encounter with our uncle and was shocked to learn about it. While I was writing On Bittersweet Place, I read aloud the Prologue to my mother. Her family had fled from Russia after World War I. In the book, Lena’s family also fled then. “But that’s not the way it happened,” my mother said after she listened to the Prologue. She frowned, and corrected the facts. When my children were young, writing temporarily whisked me away from the worries, joys, and responsibilities that come with raising a family. My children are grown; I miss the immediacy of being a mother. Now writing takes me away from daily obligations and the startling sense that time is passing, more quickly every year, it seems. I’ve learned that, for me, the process of writing is pleasurable as well as difficult and challenging, but it is the pleasure that I love. Diving into the unknown. I didn’t understand this at the time I talked to the gray-haired professor or I would have told him this. When I’m concentrating on writing, in that special mental space, immersed in the flow of writing, I’m not thinking about real life or having a book published or being reviewed or whether a reader will like my work or not. I’m not thinking about TIME magazine or misunderstandings or the labor of writing—the decisions, doubt, and revisions—or the crumbs of my life. I am in love with the process, hard as it is at times, in love with what I do in a room alone: putting one word after another on paper or on the computer. Revising those words. I love the joy of creating something new. When I write, I feel most myself, and not like myself at all. If the work is going smoothly—and even when it’s difficult—I am a happy contradiction. I am ageless. I am young; I am old. I am living many lives. I am the age of whatever characters I am writing about. My characters are my companions. I carry their baggage, fears, and happiness, their emotions. I’m wandering in the great green expanse of my imagination, trying to capture feelings and descriptions, images, characters, and scenes before they fly away and disappear. 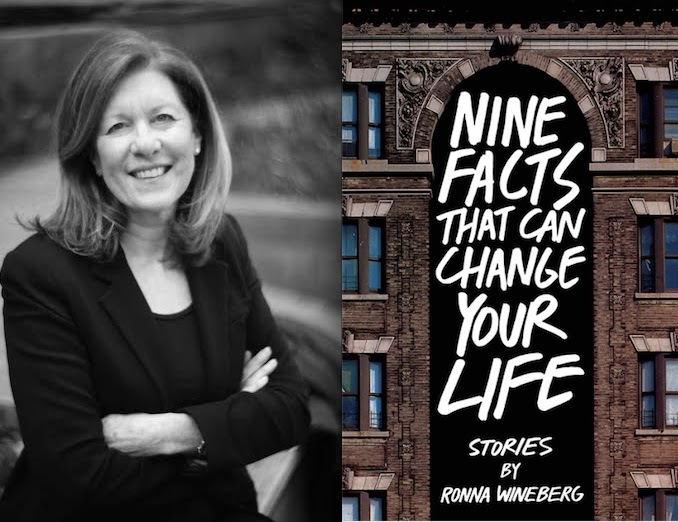 Ronna Wineberg is the author of a novel, On Bittersweet Place (Relegation Books, 2014), and two collections of short fiction: Second Language (New Rivers Press, 2005), which won the New Rivers Press Many Voices Project Literary Competition and was the runner-up for the 2006 Reform Judaism Prize for Jewish Fiction, and Nine Facts That Can Change Your Life, which was published earlier this year by Serving House Books. Her stories have appeared in such places as American Way, Confrontation, Colorado Review, Michigan Quarterly Review, and South Dakota Review, and have also been broadcast on National Public Radio.